After some distribution hiccups, I’m thrilled to announce UK and worldwide publication of Dark Waters, first in The Expedition trilogy chronicling the first human-powered circumnavigation of the Earth. UK best price £7:32 with Amazon.co.uk, Blackwell’s or Waterstones. Australia: Bookworld, Angus and Roberston. Ebook version available for Kindle, Nook, iTunes, Google Play, Kobo. Get signed copies direct from the publisher. DESCRIPTION: He survived a terrifying crocodile attack off Australia’s Queensland coast, blood poisoning in the middle of the Pacific, malaria in Indonesia and China, and acute mountain sickness in the Himalayas. He was hit by a car and left for dead with two broken legs in Colorado, and incarcerated for espionage on the Sudan-Egypt border. But it was more than just a physical challenge. Prompted by what scientists have dubbed the “perfect storm” as the global population soars to 8.3 billion by 2030, adventurer Jason Lewis used the expedition to reach out to thousands of schoolchildren, calling attention to our interconnectedness and shared responsibility of an inhabitable Earth for future generations. 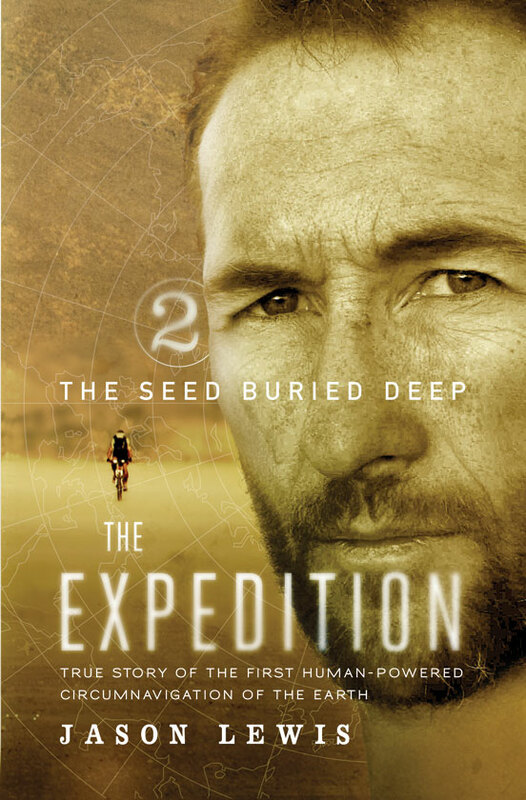 The second book in the series, The Seed Buried Deep, will be available soon. Apologies for the delay in publication. Special thanks for bringing this story to the written page go to Kenny Brown (photos), Tammie Stevens (editor), Rob Antonishen (maps), and Anthony DiMatteo (editing). This entry was posted in Dark Waters Excerpts and tagged adventure, books, circumnavigation, expeditions, human power, travel by admin. Bookmark the permalink. All right! Can we get the book here in California? Absolutely, Jim. Great to hear from you. Must be v. proud of Crister’s recent fundraising success. just finished your book.. inspirational read! G’day Jason, Thanks for the words of encouragement. Would it be possible to get some kind of endorsement of our trip from your good self. that we can put on our website? -maybe just a line or two..
appreciate your busy. So,would be grateful if you get time.. When are you coming to the Big Island for a book signing? Hi Jason, How are you? And how are things going with the trilogy? I’d like to buy the set for my daughter for Christmas. How do I go about that? Thank you and All the Best, Lori W.
Just finished reading the first volume of the trilogy. Can you give us an estimate of when the second and third volume will be on iBooks? Hi Peter. Second part due in a few weeks – end of October. Three is scheduled for next year. It’s being printed this week.